The social share widget gives visitors an easy way to share your page to their social media accounts. You can add sharing options for Facebook, Twitter, and LinkedIn. Once you add the widget to your page, click on any of the default icons to open the settings side panel. From there, you can remove any services you don’t want to include by clicking the trash can icon. Click on any service to open its URL settings. If you choose Share this page URL on… the widget will automatically use the URL of your page (unless your page is published to a Facebook tab). Alternatively, you can choose another URL you’d like visitors to share. This is useful if you include a sharing options on a thank you page but want your customers to share your sales or opt-in page. To reorder the services in the widget, click the up/down arrows in the settings sidebar, to the left of each service icon. The social sharing icons can be oriented horizontally or vertically—just click Orientation in the widget settings panel and choose your desired option. To match your brand or the look of your page, you can adjust the social share icon colors. Click the color picker to open the widget color settings, then choose a color for the sharing buttons (the background color) and their icons. 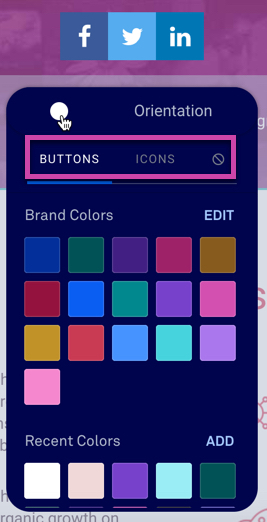 Use the color picker to choose from your brand colors, recent colors, or click ADD next to "Recent Colors" to enter hex codes or select a different color for your date widget as seen below. If you’d like to use each service’s brand colors, you’ll just need to clear your custom colors using the slashed-circle icon. How can I add other networks to the sharing options? At this time, we support sharing to Facebook, Twitter, and LinkedIn. If another service you use provides a share URL, you can use the icon widget to link their icon to that URL. Please keep in mind that this setup is limited by the ability to get a URL that enables sharing from your service of choice. The preview that shows up in the sharing options isn’t what I expected… what can I do?